Nas will be working behind the camera on an indie film called The Land that will premiere at the Sundance Film Festival in January and will star Erykah Badu. According to Variety, he’ll serve as an executive producer on the project and will also produce its soundtrack. The movie is about four teenage boys who are trying to get out of their Cleveland neighborhoods and “pursue professional skateboarding,” Variety explains. Things take a turn when they get mixed up with a drug “queenpin.” No word yet on what role Badu will play. Something tells me that it’ll have the feel of Dope, the critically acclaimed indie film from earlier this year that followed the goings-on of teenage kids in California. “[I’m a] huge fan of my man Steve Caple Jr. 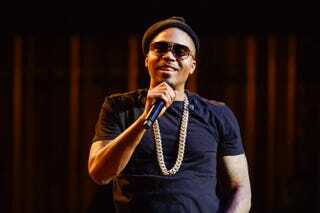 I think he can become the next great filmmaker," Nas said about the film’s writer and director. "[I’m] also, very excited to be working with my former agent and friend Charles King on his first film with his new venture. All great energy around the film, which I believe will yield amazing results,” Nas said about another producing partner. The Land also stars Michael K. Williams and Detroit rapper Machine Gun Kelly.